The Biddeford Cultural and Heritage Center is seeking nominations for its second annual Biddeford Hall of Fame. Selected inductees will be recognized in a ceremony honoring their contributions to the community at 8 p.m. June 21 at the LaKermesse Festival grounds main event tent. Nominees must be a current or former resident of Biddeford, or someone who has made a significant impact in the city or the world around them. Voting will take into consideration the significance of a nominee’s ethnic background. Nomination forms are available on the BCHC website, as well as at Biddeford Saco Chamber of Commerce, McArthur Library, Biddeford City Hall and the Heart of Biddeford offices. They should be submitted along with no more than two pages of text detailing the nominee’s contribution or accomplishments. Any nomination submitted last year, but not selected, is eligible for consideration for this year’s nominations. Individuals also may nominate themselves. Completed information may be mailed to: BCHC, c/o Diane Cyr, P.O. Box 896, Biddeford 04005-0896 or email documents to [email protected] The information also may be submitted via the website at BiddefordCulturalandHeritageCenter.org. Deadline for submissions is May 9. For more details, call 283-3993. Spring curbside collection leaf bags are available to residents this Tuesday while supplies last at the Public Works Office on 101 Woods Road. Filled leaf bags will be collected curbside on May 10 and 17 only, with pick-up beginning at 7 a.m.
Brush will not be collected curbside but can be brought to the transfer station. Please do not put brush in the leaf bags. Transfers station hours are from noon to 4 p.m. Tuesdays and Thursdays; 7 a.m. to 5 p.m. Fridays and 9 a.m. to 5 p.m. Saturdays. For more details, call the Public Works Office at 781-3919. The Pine Tree “Event Winners” are the alliance partners Team 5687, The Outliers from Baxter Academy for Tech & Sciences, Portland; and Team 133, B.E.R.T. from Bonny Eagle High School, Standish. The District “Event Finalists” included Team 6161, Equilibrium, from Gray-New Gloucester High School. The “Industrial Design Award” sponsored by General Motors went to Team 6329, The Buck’s Wrath, from Bucksport High School. The “Entrepreneurship Award sponsored by Kleiner Perkins Caulfield and Byers” went to Team 4564, Orange Chaos, from Brewer High School. The “Excellence in Engineering Award sponsored by Delphi” went to Team 5687, The Outliers from Baxter Academy, Portland. The “Gracious Professionalism Award sponsored by Johnson & Johnson” went to Team 4041, The Iron Tigers from Gardiner. The “Innovation in Control Award sponsored by Rockwell Automation” was won by Bonny Eagle High School’s Team 133, B.E.R.T. The “Imagery Award in honor of Jack Kamen” went to Team 172, The Northern Force, from Gorham and Falmouth high schools. The Solon Center for Research and Publishing is sponsoring a writing contest to be held in conjunction with a planned art exhibit at its new gallery, Fukurou, at 20 Main St. in August. Winners will be published and exhibited at Fukurou. The intent is to offer a display of visual art paired with the written word. Writers are asked to create their prose based on photographs of the art work that is posted online at galleryfukurou.com/writing-contest-at-fukurou-gallery. The contest is open to Maine residents only. Writers may submit more than one story, with a maximum of 800 words per story. Word documents should be attached to the images and should include the contributor’s name and contact information, or copy and paste the story, in an e-mail to [email protected] Submissions must be electronic only. They must be a story, not poetry. Deadline for submissions is May 27. Every writer published will receive a free book and promotion of their story on our multiple media platforms. An opening night of the exhibit will also be a book signing night celebration with authors. Sixteen Wells Elementary School students recently were recognized as achieving “Most Improved Student” status among their peers based on a variety of factors including improvement in academics, social behavior, cooperation with others, completion of homework, study habits and general attitude among their teachers and peers. Samantha Palma of Harpswell, a senior at Baxter Academy for Technology and Science, was awarded a CMiC-Allen Berg Memorial Scholarship in the amount of $10,000. 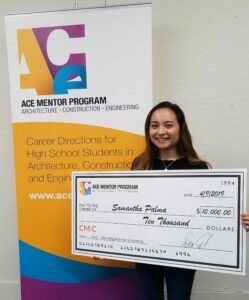 She is one of 25 students selected from a nationwide pool of 10,000 nominees to receive a portion of a $400,000 scholarship program organized by the ACE Mentor Program of America. Named in honor of the late founder of the construction management software company CMiC, the awards are intended to assist student recipients who plan to study architecture, engineering or construction in college. Palma has participated for three years in the program run by ACE’s Maine affiliate. She plans to attend the University of Maine this fall to study civil and environmental engineering. Palma and the other scholarship winners will receive their awards at ACE’s 25th Anniversary Celebration in Washington, D.C., on May 14. Angela Daigle of Turner was presented with a Maine Legislative Memorial Scholarship in the Maine Senate on April 11. A former Ricker Hill Orchard employee, Daigle attends college at Husson University, where she studies communications and audio engineering. The Maine Legislature recognizes one student from each county annually with a $1,000 scholarship to pursue a two- or four-year degree at a Maine college or technical school. Wade Wahlig, a sophomore at Falmouth High School, is Maine’s winner of the Google Science Fair. Wade created a device capable of detecting and disabling illegal unmanned aerial vehicles. This is designed to keep drones out of airspace near airports, borders, and prisons. “In recent years, illegal drone usage has become more and more prevalent. This is a very real problem, with countless examples showing up with startling frequency in the news. 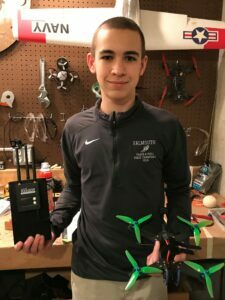 The goal of my project was to stop these unmanned aerial vehicles, more commonly referred to as drones, from participating in illegal activities such as delivering contraband into prisons and across borders or photographing/videotaping government facilities,” Wahlig wrote. Wade was sent a package from Google that included a new tablet and other merchandise. He will advance to compete at the regional level of the Google Science Fair.